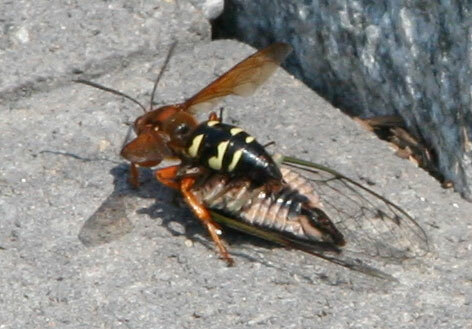 A cicada killer wasp was found burrowing between sidewalk pavers and curbstones. We have a 3 year old, should we be concerned about her or visitors getting stung? Photo shows was with captured cicada. Thanks for the information even with GPS coordinates! That is definitely a female cicada killer. She is making her way back to her burrow with a Tibicen canicularis cicada. The cicada also looks to be female. Regarding your concerns about cicada killers and your child, I wouldn't worry. The males don't have any stingers and the females are not interested in humans. I have even stolen many cicadas from cicada killer females and have never ever been stung. I have one in a jar that I caught at my house in Roanoke Virginia today!!! It was carrying a Cicada, and this is the second year I have caught one !! does that mean its nest is near!!! I am highly allergic to bees !!! whom do I contact?? Really worried here in Roanoke !!! !Thank you! !